Sometimes we just want easy for supper. And if easy can create a bit of an ooh la la when it hits the dining table, all the better. So grab a fiver and get thee to a veggie stand. It’s time to roast a whole head of cauliflower. You can’t deny the elegance and beauty in this pan. Glory glory! Let’s get to the cooking. 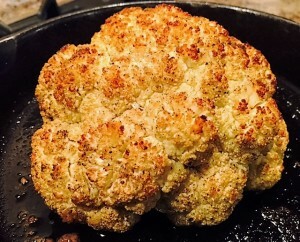 First of all, you only need 4 ingredients: a head of cauliflower, extra virgin olive oil, sea salt, and pepper. And here’s what you do. Preheat the oven to 350 degrees. Remove all outer leaves from the cauliflower, and carefully chisel out a bit of the core at the base. Be sure not to cut off any of the florets. Rub the entire head, top and bottom, with liberal amounts of olive oil. Don’t be stingy! Generously sprinkle all surface areas with sea salt and pepper. Pour a bit of olive oil onto your pan – I used a cast iron skillet, but a baking sheet will do. Carefully set your cauliflower in the middle of the pan and tent it with aluminum foil. Place in oven for 30 minutes. Remove foil, baste the head with oil from the pan, and bake for another 45-60 minutes. Baste another couple of times. Cauliflower is ready once the outside turns golden brown and a knife deeply inserted yields to tender innards.